If you have been injured in an accident in the Flint Creek Valley, you should make sure to have your case reviewed by an aggressive, honest, and experienced attorney. It doesn't matter whether you were hurt on a State Highway, a county road, or a city street, you deserve to have a lawyer who knows the RIGHT way to work with insurance companies. You have nothing to lose by calling us now for a free, no obligation appointment. We will give you a free case evaluation of your claim. Unlike many law firms, we will be happy to discuss your case in detail with you over the telephone. Of course, you are always welcome to come in and meet with Mike in person. At Grayson Law Firm, we will review your case with you, and then let you know whether or not you have a strong claim. If you need money to cover lost wages or medical bills before you agree to a final settlement, we can often get that for you under Montana law. We will look at all available sources to obtain payment for you, and we make sure that we have asked for payment from the insurance company for all areas where you have been injured. 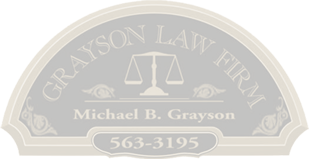 Grayson Law Firm will take your case on a contingency fee basis. That means you pay no fees up front, and you will owe us nothing if we fail to get you a settlement or a jury verdict in your favor. We obtain settlements for most of our auto accident clients without needing to go to trial. However, if your case does go to trial, you can take comfort knowing that Mike has tried over two dozen cases over the years, with very good results. Call either our local (406) 563-3195 or toll free (888) 888-3315 numbers now to speak with Mike Grayson about your accident case. You have nothing to lose and much to gain by calling now!